...but it did get finished! We hadn't found a blankie yet for Newest. 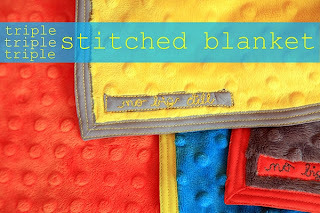 So when I saw this project by No Big Dill over at Delia's Nesting Series, it immediately got pinned. I did make a couple alterations to the original tutorial. First, I did not get the triple stitch in. That was a little frustrating, but I just couldn't seem to get the stitches on in a way to allow three rows. I still really wish I could have gotten the third row in, but I am still pretty pleased how it turned out. The second alteration I made I did intentionally. I had learned about the tip to sew diamonds into the minky to help the material stabilize. It is tedious work, but it is well worth it, AND I think it totally adds an extra detail to the blankie itself. The last little touch was to mimic the original sewn on tag. I wanted to hand stitch newest's first and middle name onto the little tag. Then I attached the tag using the machine. A perfect little handmade touch. Now Newest has a blankie to snuggle in. Hopefully he will just adore it. How is your pinterest list going? I love that fabric! And Eli still loves that tag blankie (thanks, again)! I think I'll be using this idea for my next baby. We hope you are all doing well. Say hi to Spencer for us. That turned out so awesome!! geez, amazing! and you hand stitched the baby's name!? how did you hand stitch letters?! lol. that's amazing.